As we know, the labour market and university studies now demand students comfortable with researching information on the Internet, able to process this information and digitally present it using word processing, a slide show, a web site, etc. They must also know how to communicate and collaborate remotely with their professional colleagues. 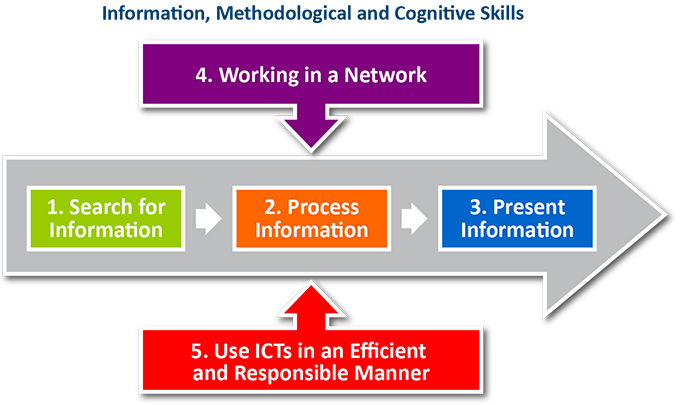 We can use the ICT Profile for College Students which describes each of these skills to facilitate their mastery. The Profile was developped by members of the IT Representatives' Network (pedagogical counselors and librarians) as well as members of some forty cegeps who divided the work of integrating this material into academic programs. ICT Profile for College Students. What you may not know is that there is a good chance that in your class, you have already involved your students in an activity that contributes to their mastery of skills within the ICT Student Profile (eg, conducting a research project, producing a concept map, working in teams, calculating with a spreadsheet, etc.). And, if you've done that, there's a good chance that teachers in your discipline or the program in which you teach have also done so. In order to verify what skills from the ICT Student Profile are already integrated into your courses and those of your colleagues, Lorraine Ouellette of the Cégep de Victoriaville produced a grid matching skills to courses for each of the skills within the Profile, allowing the identification of the courses in which these skills are acquired. This matching grid was updated in 2015. If you would like to further explore the integration of the IT Profile's skills for students, please refer to the case studies below (in French). The integration of the IT Profile program into Sciences humaines at Cégep de Victoriaville. The integration of the IT Profile program into the Tourism program at Cégep de Granby Haute-Yamaska​​. Other interesting documents to consult include the Profile's integration ​​at Cégep de Jonquière and its associated website produced for teachers and students. In the coming months, college teachers will also be able to consult a bank of questions to help them assess the mastery of the IT Profile's skills within a formative or summative context. There will be more about this later! Earlier, we told you that there is very good chance that you are already doing activities which are a part of the Student ICT Profile in your class, and we want to know which ones. Here's what we propose - After a first overview of the profile, identify those skills that are covered in your courses and what activities you're presenting to ensure their mastery. Your answers will be of enormous help to the team working on the ICT Profile for College Students. Thank you in advance!